Turkey's foreign minister Ahmet Davutoglu has met with exiled Hamas leader Khaled Meshaal in Syria, Turkey's official news agency reports. The pair discussed ways of improving relations between Hamas and Fatah Palestinian groups, according to Anatolia news agency. The Hamas website said they also spoke of how to break Israel's Gaza blockade. The talks threaten to increase tensions between Turkey and Israel at a time when relations are already strained. In May, nine people died when Israeli commandos intercepted a Turkish aid flotilla bound for Gaza. The incident sparked anti-Israeli protests across Turkey. Turkey are requesting an independent probe into the raid on the convoy and an apology, but Israel has so far said it is not necessary and says it is conducting its own investigation. On the group's website, Hamas said that Mr Davutoglu had pledged that Turkey would "pursue its efforts to lift" the Israeli blockade of the Gaza Strip. Turkey has previously maintained that a peace deal must include Hamas, but has also called for the armed group to renounce violence. 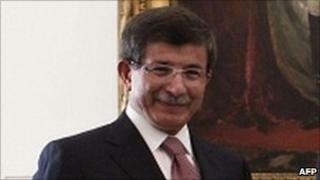 Mr Davutoglu was on a one-day trip to Damascus for talks with Syrian President Bashar al-Assad.